The Assistant Commandant of the Marine Corps (ACMC) is the second highest-ranking officer in the United States Marine Corps, and serves as a deputy for the Commandant of the Marine Corps (CMC). Before 1946, the title was known as Assistant to the Commandant. The Assistant Commandant is nominated for appointment by the President and must be confirmed via majority vote by the Senate. In the event that the Commandant is absent or is unable to perform his duties, the Assistant Commandant assumes the duties and responsibilities of the Commandant. For this reason, the Assistant Commandant is appointed to a rank equal to the sitting Commandant; since 1971, each Assistant Commandant has been, by statute, a four-star general, making it the most common rank held among Marines serving this position. Additionally, he may perform other duties that the CMC assigns to him. Historically, the Assistant Comandant has served for two to three years. In recent decades, the Assistant Commandant has frequently been a Marine aviator. James F. Amos is the first aviator to serve as Assistant Commandant and then be promoted to Commandant. The 34th and current Assistant Commandant is Glenn M. Walters, who took office on 4 August 2016, when John M. Paxton Jr. retired. The first Marine to hold the billet as "Assistant to the Commandant" was Eli K. Cole (Allen H. Turnage being the last), while Lemuel C. Shepherd Jr. was the first to hold it as the "Assistant Commandant". Then–Lieutenant General Glenn M. Walters was nominated on 7 June 2016 to succeed Paxton as Assistant Commandant; at the time, he was serving as Deputy Commandant for Programs and Resources. Before the official title of "Assistant Commandant of the Marine Corps" was adopted in 1946, the title of the position was known as the "Assistant to the Commandant" and before 1918, known only as "Duty in the Office of the Commandant". No records exist before the outbreak of World War I about this position, possibly because the Commandant likely had only administrative staff and no deputy. The first Assistant to the Commandant was Lieutenant Colonel (from 1914 Colonel) Eli K. Cole, who assumed the position on April 29, 1911. From April 29, 1911 to October 16, 1946, 19 men were assigned to assist the commandant, including five who later became Commandant: John A. Lejeune, Wendell C. Neville, Ben H. Fuller, John H. Russell Jr., and Alexander A. Vandegrift. In 1946, Congress established the position of "Assistant Commandant of the Marine Corps" and since then, 31 men have held the position. Major General Lemuel C. Shepherd Jr. was the first to hold the billet and went on to become Commandant, as well as six others: Randolph M. Pate, Leonard F. Chapman Jr., Robert H. Barrow, Paul X. Kelley, James F. Amos and Joseph Dunford. As with the Commandant, the Assistant Commandant of the Marine Corps is appointed by the President based on advice and consent of the Senate and, once appointed, will be promoted to the grade of general. The duties of the Assistant Commandant include such authority and duties as the Commandant – and with the approval of the Secretary of the Navy – may delegate to or prescribe for him. Orders issued by the Assistant Commandant in performing such duties have the same effect as those issued by the Commandant. When there is a vacancy in the office of Commandant of the Marine Corps, or during the absence or disability of the Commandant, the Assistant Commandant shall perform the duties of the Commandant until a successor is appointed or the absence or disability ceases. Nofi, Albert A. (1997). "The Assistant Commandants of the Marine Corps". The Marine Corps Book of Lists. Da Capo Press. p. 146. ISBN 0-938289-89-6. https://books.google.com/books?id=Klj6BNUn9LcC&pg=PA146. Retrieved 2007-12-19. Allan Reed Millett and Jack Shulimson, ed (2004). Commandants of the Marine Corps. Annapolis, Md. : Naval Institute Press. ISBN 978-0-87021-012-9. https://books.google.com/books?id=Qns8bW_SESYC. ↑ 1.0 1.1 10 U.S.C. § 5044 Assistant Commandant of the Marine Corps. ↑ 4.0 4.1 4.2 "Marine Corps Assistant Commandants". 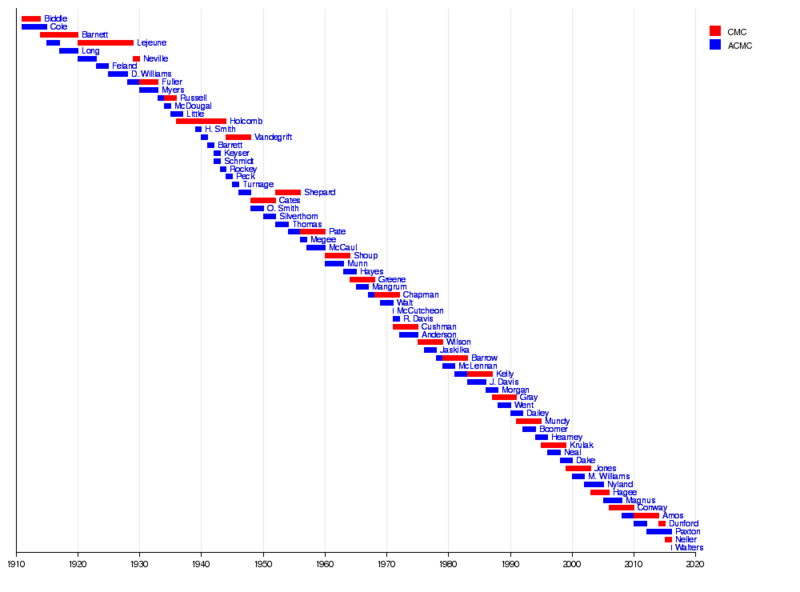 Historical Topics: Frequently Requested. Reference Branch, History Division, United States Marine Corps. http://www.tecom.usmc.mil/HD/Frequently_Requested/Assistant_Commandant.htm. Retrieved 2007-12-29. ↑ "Lieutenant colonel Eli Kelley Cole, USMC". Who's Who in Marine Corps History. History Division, United States Marine Corps. http://www.tecom.usmc.mil/HD/Whos_Who/Cole_EK.htm. Retrieved 2009-07-03. ↑ "Brigadier general John Archer Lejeune, USMC". Who's Who in Marine Corps History. History Division, United States Marine Corps. http://www.tecom.usmc.mil/HD/Whos_Who/Lejeune_JA.htm. Retrieved 2009-07-03. ↑ "Brigadier general Charles Grant Long, USMC". Who's Who in Marine Corps History. History Division, United States Marine Corps. http://www.tecom.usmc.mil/HD/Whos_Who/Long_CG.htm. Retrieved 2009-07-03. ↑ "Major general Wendell Cushing Neville, USMC". Who's Who in Marine Corps History. History Division, United States Marine Corps. http://www.tecom.usmc.mil/HD/Whos_Who/Neville_WC.htm. Retrieved 2009-07-03. ↑ "Brigadier general Logan Feland, USMC". Who's Who in Marine Corps History. History Division, United States Marine Corps. http://www.tecom.usmc.mil/HD/Whos_Who/Feland_L.htm. Retrieved 2009-07-03. ↑ "Brigadier general Dion Williams, USMC". Who's Who in Marine Corps History. History Division, United States Marine Corps. http://www.tecom.usmc.mil/HD/Whos_Who/Willams_D.htm. Retrieved 2009-07-03. ↑ "Brigadier general Ben Hebard Fuller, USMC". Who's Who in Marine Corps History. History Division, United States Marine Corps. http://www.tecom.usmc.mil/HD/Whos_Who/Fuller_BH.htm. Retrieved 2009-07-03. ↑ "Brigadier general John Twiggs Myers, USMC". Who's Who in Marine Corps History. History Division, United States Marine Corps. http://www.tecom.usmc.mil/HD/Whos_Who/Myers_JT.htm. Retrieved 2009-07-03. ↑ "Brigadier general John Henry Russell Jr., USMC". Who's Who in Marine Corps History. History Division, United States Marine Corps. http://www.tecom.usmc.mil/HD/Whos_Who/Russell_JH.htm. Retrieved 2009-07-03. ↑ "Brigadier general Douglas C. McDougal, USMC". Who's Who in Marine Corps History. History Division, United States Marine Corps. http://www.tecom.usmc.mil/HD/Whos_Who/McDougal_DC.htm. Retrieved 2009-07-03. ↑ "Brigadier general Louis McCarty Little, USMC". Who's Who in Marine Corps History. History Division, United States Marine Corps. http://www.tecom.usmc.mil/HD/Whos_Who/Little%20LM.htm. Retrieved 2009-07-03. ↑ "Brigadier general Holland McTyeire Smith, USMC". Who's Who in Marine Corps History. History Division, United States Marine Corps. http://www.tecom.usmc.mil/HD/Whos_Who/Smith_HM.htm. Retrieved 2009-07-03. ↑ "Brigadier general Alexander Archer Vandegrift, USMC". Who's Who in Marine Corps History. History Division, United States Marine Corps. http://www.tecom.usmc.mil/HD/Whos_Who/Vandegrift_AA.htm. Retrieved 2009-07-03. ↑ "Major general Charles Dodson Barrett, USMC". Who's Who in Marine Corps History. History Division, United States Marine Corps. http://www.tecom.usmc.mil/HD/Whos_Who/Barrett_CD.htm. Retrieved 2009-07-03. ↑ "Major general Ralph Stover Keyser, USMC". Who's Who in Marine Corps History. History Division, United States Marine Corps. http://www.tecom.usmc.mil/HD/Whos_Who/Keyser_RS.htm. Retrieved 2009-07-03. ↑ "Major general Harry Schmidt, USMC". Who's Who in Marine Corps History. History Division, United States Marine Corps. http://www.tecom.usmc.mil/HD/Whos_Who/Schmidt_H.htm. Retrieved 2009-07-03. ↑ "Major general Keller E. Rockey, USMC". Who's Who in Marine Corps History. History Division, United States Marine Corps. http://www.tecom.usmc.mil/HD/Whos_Who/Rockey_KE.htm. Retrieved 2009-07-03. ↑ "Major general DeWitt Peck, USMC". Who's Who in Marine Corps History. History Division, United States Marine Corps. http://www.tecom.usmc.mil/HD/Whos_Who/Peck_D.htm. Retrieved 2009-07-03. ↑ "Major general Allen Hal Turnage, USMC". Who's Who in Marine Corps History. History Division, United States Marine Corps. http://www.tecom.usmc.mil/HD/Whos_Who/Turnage_AH.htm. Retrieved 2009-07-03. ↑ "Major general Lemuel Cornick Shepherd Jr., USMC". Who's Who in Marine Corps History. History Division, United States Marine Corps. http://www.tecom.usmc.mil/HD/Whos_Who/Shepherd_LC.htm. Retrieved 2009-07-03. ↑ "Major general Oliver P. Smith, USMC". Who's Who in Marine Corps History. History Division, United States Marine Corps. http://www.tecom.usmc.mil/HD/Whos_Who/Smith_OP.htm. Retrieved 2009-07-03. ↑ "Lieutenant general Merwin Hancock Silverthorn, USMC". Who's Who in Marine Corps History. History Division, United States Marine Corps. http://www.tecom.usmc.mil/HD/Whos_Who/Silverthorn_MH.htm. Retrieved 2009-07-03. ↑ "Lieutenant general Gerald C. Thomas, USMC". Who's Who in Marine Corps History. History Division, United States Marine Corps. http://www.tecom.usmc.mil/HD/Whos_Who/Thomas_GC.htm. Retrieved 2009-07-03. ↑ "Lieutenant general Randolph McCall Pate, USMC". Who's Who in Marine Corps History. History Division, United States Marine Corps. http://www.tecom.usmc.mil/HD/Whos_Who/Pate_RM.htm. Retrieved 2009-07-03. 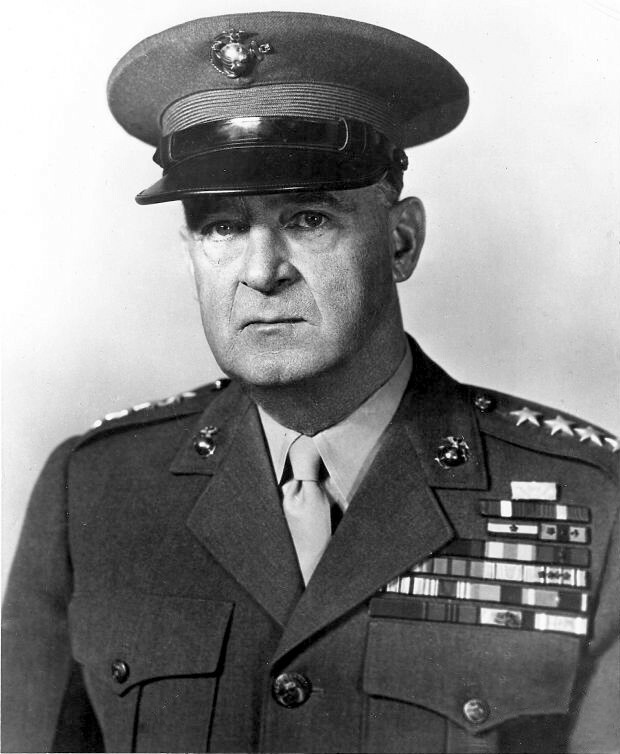 ↑ "Lieutenant general Vernon E. Megee, USMC". Who's Who in Marine Corps History. History Division, United States Marine Corps. http://www.tecom.usmc.mil/HD/Whos_Who/Megee_VE.htm. Retrieved 2009-07-03. ↑ "Lieutenant general Verne J. McCaul, USMC". Who's Who in Marine Corps History. History Division, United States Marine Corps. http://www.tecom.usmc.mil/HD/Whos_Who/MacCaul_VJ.htm. Retrieved 2009-07-03. ↑ "Lieutenant general John Calvin Munn, USMC". Who's Who in Marine Corps History. History Division, United States Marine Corps. http://www.tecom.usmc.mil/HD/Whos_Who/Munn_JC.htm. Retrieved 2009-07-03. ↑ "Lieutenant general Charles Harold Hayes, USMC". Who's Who in Marine Corps History. History Division, United States Marine Corps. http://www.tecom.usmc.mil/HD/Whos_Who/Hayes_CH.htm. Retrieved 2009-07-03. ↑ "Lieutenant general Richard C. Mangrum, USMC". Who's Who in Marine Corps History. History Division, United States Marine Corps. http://www.tecom.usmc.mil/HD/Whos_Who/Mangrum_RC.htm. Retrieved 2009-07-03. ↑ "Lieutenant general Leonard Fielding Chapman, USMC". Who's Who in Marine Corps History. History Division, United States Marine Corps. http://www.tecom.usmc.mil/HD/Whos_Who/Chapman_LF.htm. Retrieved 2009-07-03. ↑ "General Lewis W. Walt, USMC". Who's Who in Marine Corps History. History Division, United States Marine Corps. http://www.tecom.usmc.mil/HD/Whos_Who/Walt_LW.htm. Retrieved 2009-07-03. ↑ "General Keith B. McCutcheon, USMC". Who's Who in Marine Corps History. History Division, United States Marine Corps. http://www.tecom.usmc.mil/HD/Whos_Who/McCutcheon_KB.htm. Retrieved 2009-07-03. ↑ "General Raymond Gilbert Davis, USMC". Who's Who in Marine Corps History. History Division, United States Marine Corps. Archived from the original on 2011-06-15. https://web.archive.org/web/20110615094253/http://www.tecom.usmc.mil/HD/Whos_Who/Davis_RG.htm. Retrieved 2009-07-03. ↑ "General Earl Edward Anderson, USMC". Who's Who in Marine Corps History. History Division, United States Marine Corps. http://www.tecom.usmc.mil/HD/Whos_Who/Anderson_EE.htm. Retrieved 2009-07-03. ↑ "General Samuel Jaskilka, USMC". Who's Who in Marine Corps History. History Division, United States Marine Corps. http://www.tecom.usmc.mil/HD/Whos_Who/Jaskilka_S.htm. Retrieved 2009-07-03. ↑ "General Robert H. Barrow, USMC". Who's Who in Marine Corps History. History Division, United States Marine Corps. Archived from the original on 2012-04-18. https://web.archive.org/web/20120418190027/http://www.tecom.usmc.mil/HD/Whos_Who/Barrow_RH.htm. Retrieved 2009-07-03. ↑ "General Kenneth McLennan, USMC". Who's Who in Marine Corps History. History Division, United States Marine Corps. http://www.tecom.usmc.mil/HD/Whos_Who/McLennan_K.htm. Retrieved 2009-07-02. ↑ "General Paul X. Kelley, USMC". Who's Who in Marine Corps History. History Division, United States Marine Corps. http://www.tecom.usmc.mil/HD/Whos_Who/Kelley_PX.htm. Retrieved 2009-07-02. ↑ "General John K. Davis, USMC". Who's Who in Marine Corps History. History Division, United States Marine Corps. http://www.tecom.usmc.mil/HD/Whos_Who/Davis_JK.htm. Retrieved 2009-07-02. ↑ "General Thomas R. Morgan, USMC". Who's Who in Marine Corps History. History Division, United States Marine Corps. http://www.tecom.usmc.mil/HD/Whos_Who/Morgan_TR.htm. Retrieved 2009-07-02. ↑ "General Joseph J. Went, USMC". Who's Who in Marine Corps History. History Division, United States Marine Corps. http://www.tecom.usmc.mil/HD/Whos_Who/Went_JJ.htm. Retrieved 2009-07-02. ↑ "General John R. Dailey, USMC". Who's Who in Marine Corps History. History Division, United States Marine Corps. http://www.tecom.usmc.mil/HD/Whos_Who/Dailey_JR.htm. Retrieved 2009-07-02. ↑ "General Walter E. Boomer, USMC". Who's Who in Marine Corps History. History Division, United States Marine Corps. http://www.tecom.usmc.mil/HD/Whos_Who/Boomer_WE.htm. Retrieved 2009-07-02. ↑ "General Richard D. Hearney, USMC". Who's Who in Marine Corps History. History Division, United States Marine Corps. http://www.tecom.usmc.mil/HD/Whos_Who/Hearney_RD.htm. Retrieved 2009-07-02. ↑ "General Richard I. Neal, USMC". Who's Who in Marine Corps History. History Division, United States Marine Corps. http://www.tecom.usmc.mil/HD/Whos_Who/Neal_RI.htm. Retrieved 2009-07-02. ↑ "General Terrence R. Dake, USMC". Who's Who in Marine Corps History. History Division, United States Marine Corps. http://www.tecom.usmc.mil/HD/Whos_Who/Dake_TR.htm. Retrieved 2009-07-02. ↑ "General Michael J. Williams, USMC". Who's Who in Marine Corps History. History Division, United States Marine Corps. http://www.tecom.usmc.mil/HD/Whos_Who/Williams_MJ.htm. Retrieved 2009-07-02. ↑ "General William L. "Spider" Nyland, USMC". Who's Who in Marine Corps History. History Division, United States Marine Corps. http://www.tecom.usmc.mil/HD/Whos_Who/Nyland_WL.htm. Retrieved 2009-07-02. ↑ "General Robert Magnus, USMC". Who's Who in Marine Corps History. History Division, United States Marine Corps. http://www.tecom.usmc.mil/HD/Whos_Who/MAGNUS_R.htm. Retrieved 2009-07-02. ↑ "General James F. Amos, USMC". Who's Who in Marine Corps History. History Division, United States Marine Corps. http://www.tecom.usmc.mil/HD/Whos_Who/Amos_JF.htm. Retrieved 2009-07-02. ↑ "General Joseph F. Dunford Jr., USMC". Who's Who in Marine Corps History. History Division, United States Marine Corps. http://www.tecom.usmc.mil/HD/Whos_Who/Dunford_JF.htm. Retrieved 2010-10-25. ↑ "General John M. Paxton Jr., USMC". Who's Who in Marine Corps History. History Division, United States Marine Corps. http://www.hqmc.marines.mil/acmc/Biography.aspx. Retrieved 2012-12-15. ↑ "General Glenn M. Walters, USMC". Who's Who in Marine Corps History. History Division, United States Marine Corps. http://www.hqmc.marines.mil/acmc/Biography.aspx. Retrieved 2016-08-04.